Jake Mulraney’s dismissal against Falkirk on Saturday was their fourth in eight games and their eighth overall this season and manager John Robertson has indicated players will pay a financial penalty from now on. Indiscipline cost Caley Jags with two penalties also contributing to their downfall in the 3-1 defeat at the weekend. Inverness sit bottom of the disciplinary table in the Championship, with their 52 bookings the joint-worst with Livingston. Robertson felt the need to introduce drastic measures in the wake of their latest indiscretions. 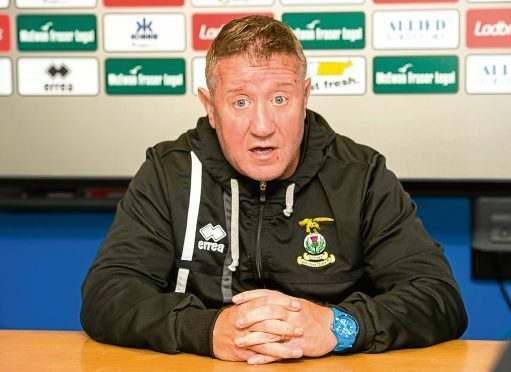 He said: “We had a real line in the sand talk at Dumbarton with regards to our defending and we did the same after Saturday about our discipline. We’re not a dirty team but we’ve had five four cards in the last eight games, which is incredible. Jake will be light in his pay packet next month and so will everybody else now if they pick up stupid yellow cards. “David Raven got sent off unfortunately, Carl Tremarco picked up a couple of yellow cards as last man and Iain Vigurs, to this day, we don’t know how he’s been sent off. I’ve been defending the players to the board all year – we fine players for dissent and for kicking the ball away, but we’re not having what happened on Saturday. Jake let the whole club down. He wasn’t at it and his whole game was slack. Midfielder Joe Chalmers, who gave away the first spot-kick against the Bairns, feels that if the measure works then it is worth doing. Chalmers said: “The fines are something new the manager talked about after the game. If that’s what it takes to stop the silly yellows and give ourselves a chance in the game, then that’s what has to happen. Everyone plays by his rules. “Nobody means to get booked or give away a penalty but it has happened quite a lot this season. Sometimes you stick a leg out through instinct but over the season our record isn’t great. But it’s not anybody doing anything deliberately. Jake came in and apologised. It didn’t help the team and it was disappointing at the time but he didn’t mean to get sent off.